Karl Amadeus Hartmann, composer and organizer of Munich's postwar contemporary music series Musica Viva, has received much attention in association with notions of inner emigration. Emerging in the postwar correspondence between Thomas Mann and Frank Thiess, the term inner emigration refers to those artists that remained in Third Reich Germany but did not publish or participate in party events, whether for political or aesthetic reasons. As inner emigration scholar Michael Philipp suggests in his social history of the phenomenon, the concept remains highly elusive. Distinctions between collaboration and so-called aesthetic resistance are often permeated by a politically charged postwar ideology that occludes the complexity involved in each artist's case. The following article chronicles Hartmann's life and output and will also survey the literature that presents Hartmann as the inner emigration composer par excellence. Karl Amadeus Hartmann was born in Munich in 1905 as the youngest of four sons within an artistically inclined lower-middle-class family. His father Friedrich Richard (1866-1925) was a professional painter, and his mother Getrud (né Schwamm, 1874-1935) expressed a keen interest in literature and music. His brother Adolf (1900-1971) also became an accomplished painter and his artistic connections, especially at the Munich Juryfreien exhibitions, were critical in shaping the young Karl Amadeus. 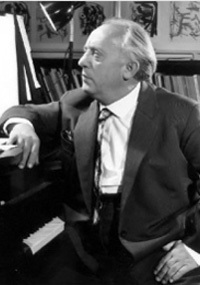 In these early years Hartmann wrote mainly in the avant-garde idiom of the great composers of the time (Hindemith, Stravinsky, Milhaud, Orff and Krenek). Despite later studying with Anton Webern, Hartmann distanced himself from the Second Viennese School. Instead, as demonstrated in the Jazz-Toccata und Fuge (1928) and the Tanzsuite (1931), Hartmann adopted jazz sonorities and rhythms, and his dense layering of percussive, polymetrical textures made the post-1933 reception of his music in Germany problematic. Furthermore, these early works frequently incorporated explicit messages of communism and did not shy from images of violent revolution. Thus, Hartmann composed two a-cappella chorales to Communist texts by Johannes Becher and Karl Marx and also a series of highly parodic Kurzopern entitled Wachsfigurenkabinett. Yet, as the latter operatic sketches attest, satire and radicalism were fashionable and could be manipulated to explore a number of coloristic musical effects. After Hitler's 1933 seizure of power, the Bavarian Radio cancelled its intended premiere of Hartmann's Burleske Musik, fearing the scandal that avant-garde idiom would create, and although he was too insignificant to be directly attacked by National Socialist sympathizers, he was nonetheless forced into a marginalized position. Not in the financial position to emigrate to Switzerland (like many of his colleagues), Hartmann was compelled to remain in Third Reich Germany, supported by his wife's family. As Michael Kater points out, although Hartmann ignored all Reichsmusikkammer letters requesting participation in official duties and for proof of his Aryan identity, he was by default an RMK member. During this time, whether for political, social or artistic reasons, Hartmann neither published nor solicited performances of his works within Nazi Germany. Instead, Hartmann directed his creative energies abroad, toward international festivals and competitions. Between the years 1933 and 1945, Hartmann appeared at several international contemporary music festivals with a declaration of independence from Third Reich Germany. This included performances of his orchestral work Miserae and of his First String Quartet at the annual IGNM festivals in Prague and London in 1935 and 1938 respectively. Both premieres were positively received abroad, lending the impression that contemporary music continued in Germany However, the Prague premiere resulted in a confrontation with National Socialist authorities and, as Kater argues, the fact that Hartmann was able to participate three years later in London suggests that Hartmann did have administrative connections. Other international recognition included the Emil Hertzka Stiftung for the choral work Anno '48 Friede, the 1936 Le Carillon prize, performances of his Symphonie L'oeuvre and the Concerto funèbre at the 1939 International Exhibitions in Belgium and Switzerland, and also broadcasts via the Belgian Radio in Brussels. Works of this time period, usually referred to as inner emigration works, often incorporate both explicit and indirect references to music that was either forbidden or discredited by the Nazi party. Thus, in his dissertation on Hartmann's opera Simplicius Simplicissimus, Rüdiger Behschnitt refers to the viola melody in the overture's Adagio section as being Jewish in origin. Moreover, as exemplified by the second movement of Symphonie L'oeuvre (which is based on an anti-war Chinese song by Confucius), the use of extra-musical sources and often autobiographically related texts serve to comment on surrounding political and social realities. This is complemented by dedications and inscriptions that were unambiguously subversive, like the dedication of Sinfoniae Drammaticae China fights to the Russian author Sergej Tretjakov and the Chinese independence-fighter Den Shi-Hua. Further, as Hartmann scholar Andreas Jaschinski articulates, the use of extended slow symphonic movements serve as elaborate lamentations; and, to contrast this, Hartmann adopts quick, ostinato-driven movements that build up into chaotic climaxes, in turn satirically undermining their own monumentality. Significantly, many of these inner emigration compositions were later reworked into postwar publications. Yet, in conformity with postwar ideological demands and emerging Cold War politics, these re-workings frequently neutralized initial political messages of socialist revolution. For example, the China fights dedication was replaced with an inscription to the Munich music critic Antonio Mingotti. Similarly, Hartmann denied the symphony's programmatic content and its revolutionary character, instead asserting that the composition was merely a simple musical exercise on an eight-measure Chinese melody. Hence, unlike many opportunistic composers during the immediate postwar period who selectively reinterpreted their works as exhibiting hidden messages of aesthetic resistance, Hartmann deemphasized and (as in the case of Sinfoniae Drammaticae) even erased those features that might be associated with political subversion and communist activity. This resulted in what some have considered to be a more subdued form of socialism, one that propounded an ethos of tolerance, love for humanity and commitment against all tyranny. Here, Hartmann's revised tone may be contextualized vis-à-vis his subsequent employment by the American military occupation, an environment that precluded communist sympathies and revolutionary activities. Before proceeding to outline Hartmann's postwar symphonic output and his efforts as organizer for the Musica Viva series, several paragraphs about the notion of aesthetic resistance are in order. Although Hans-Werner Heister alludes to Hartmann's brief involvement in an underground anti-fascist network, Hartmann scholarship for the most part constructs arguments of inner emigration and resistance in terms of a paradigm of aesthetic communication, one of writing between the lines. Also referred to as verdeckte Schreibweise (literally hidden writing), this mode of interpretation presents music as a language that is to be decoded, assuming that the listener is properly attuned within a horizon of expectation (Erwartungshorizont). In the case of Hartmann's music, this is an audience that is capable of deciphering and that most likely shares the composer's political and social messages. Needless to say, this is a paradigm that assumes the ultimate transparency of the composer's intention (irrespective of whether such a clear intention existed) and that reduces music to a means of sending and receiving encoded messages. In Heister's seminal work (Inner Emigration, Hidden Writing, Compositional Resistance: Karl Amadeus Hartmann's Output after 1933)  the same essay that transplants Dolf Sternberger's concept of verdeckte Schreibweise from literary criticism into musicological research  Heister argues that the musical quote (Musikzitat) is this paradigm's central mechanism. Here, musical quotation is broadly described as a manner of signaling a message to an appropriately critical audience, while simultaneously deceiving the unsuspecting and system-conforming listener. (Note the implicit moral judgment.) Several different types of musical allusion are enumerated, varying from direct and indirect musical quotation to extra-musical appropriation of literary topoi and ideological content. In turn, these are exemplified in Hartmann's opera Simplicius Simplissimus, a work composed in 1934 to a picaresque novel by the seventeenth-century German author Grimmelshausen (1621-1676). The first type of quotation is characterized as an inversion of negation, or the adoption of music that was forbidden within Nazi Germany. Here, Heister turns to the émigré Paul Walter Jakob, who formulates forbidden music in terms of its being Marxist (e.g. Weill and Eisler), Jewish (i.e. according to biographical details and not musical criteria), or culture bolshevist avant-garde music. Although critical of Jakob's overly-selective categorization, this tripartite model pervades Heister's analysis of the Simplicius opera. Thus, the Jewish melody Elijahu ha-navi appears in the opera's second tableau, lending a prophetic tone to the hermit's death. However, unlike the String Quartet (1933), where the same Jewish melody appears in a more conspicuous form, the Simplicius opera extrapolates only segments, instead integrating the musical reference into its surrounding content. A similar indirect musical allusion occurs in the opera's finale (directly before the Peasants' War Song), where a march-like piano piece by Prokofiev serves as a fighting song for the politically awakened Simplicius. Furthermore, Heister argues that the transition from recitando speech-song to metered and rhymed prosody (within the same number) points to a technique frequently employed by Soviet composers. Thus, Hartmann is characterized as having used all three types of forbidden music, thereby inverting Third Reich Germany's marginalization and persecution of Jewish and Marxist composers. Yet, the question remains if today's listener, let alone Hartmann's intended audience, was capable of perceiving such indirect references. If not, the theory that music functions in terms of transparent signals is misleading and fails to account for the listener's actual experience. The second type of musical quote outlined by Heister is referred to as the reclamation of history. In the early stages of Hartmann's inner emigration, satire and parodic elements pervade the compositional vocabulary. This is exemplified in Hartmann's negative depictions of soldiers and authority figures (e.g. the Governor), these being character types that were frequently championed by the Nazi party. Yet, as Heister contends, Hartmann's position is subtler than simple parody. Rather, Hartmann aspires to reclaim Germany's cultural and historical past from National Socialist misappropriation. In keeping with this, Hartmann makes explicit use of the Volkslied Wir sind Geyers Schwarzer Haufen, a song that was often used in Nazi Germany but had a longer standing history as a revolutionary song, commemorating the fight against tyranny during the Peasants' War (1524-25). As Heister maintains, Hartmann is able to reclaim history and de-ossify ideological reification by abandoning the song's usual conservative chorale treatment, instead integrating the song into a modern musical language. This is complemented by the fact that certain ambivalent passages in the song are left out in favor of an unequivocal statement of revolutionary sentiment. Hartmann's reclamation of history extends beyond explicit musical quotation. As Heister articulates, Hartmann adopts a historical subject that was common in stage works and historical novels of this time period. The Peasants' War and the Thirty Years War (1618-48), which are anachronistically combined in Hartmann's opera, also appeared in sanctified National Socialist operas; however, Hartmann uses the historical subject to depict the destruction and absurdities of war and to criticize the National Socialist trope of heroism. In a similar manner Hartmann reclaims the orchestration technique of speech-choir, what Victor Klemperer has described as the language of the Third Reich. Despite being a common technique of amateur and professional choirs at party events, Hartmann instead utilizes speech-choir in the manner of politically engaged Weimar Republic art, its use as a dramaturgical device of Marxist epic theater. In conclusion, Heister's treatment of the Simplicius opera as a series of covert political messages is insightful, and the treatment of specific moments in the musical score and libretto as decodable signals enables a thick description in terms of the deeper-lying political and cultural contexts. However, the readers of Heister's well-thought-out essay are left with a feeling of doubt whether Hartmann indeed intended such explicit messages (as his post-factum autobiographical Kleine Schriften similarly argue) and whether the music-as-language model functions effectively, given that today's listenership no longer understands these references. In the years following Germany's 1945 surrender, Hartmann was employed by American military occupation forces to promote cultural reeducation and to combat Bavarian regionalism. Although a native of Bavaria, Hartmann was deemed sufficiently free of Nazi and local party sympathies to mediate in subsequent political decisions. Given America's outstanding support and patronage, Hartmann was able to found and lead the concert series Musica Viva until his death in 1963. Here, Hartmann's creative programming and his juxtaposition of past and present musical works presented a forum for active dialogue and critical confrontation with the past. Moreover, through his active commissioning of visual artworks for the Musica Viva program booklets, and through innovative stage productions, Hartmann effectively placed contemporary music within a larger artistic and cultural community. Thus, in some sense Hartmann's Musica Viva was an anti-thesis to the contemporary festivals in Darmstadt and Donaueschingen, which stressed a Zero Hour ideology of musical autonomy and a clean break with the past. Typically, the Sixth Symphony is seen as a turning point in Hartmann's symphonic oeuvre, which in turn culminates in the Seventh and Eighth symphonies. In these works Hartmann turns increasingly to music history, experimenting with past notations, musical structures, rhythms, timbres and polyphonic textures. During his final years Hartmann exhibited a renewed interest in operatic and dramatic works. This resulted in the Gesangsszene für Bariton und Orchester, based on the prologue to Jean Giraudoux's drama Sodome et Gomorrhe. Heinz von Cramer also speaks of operatic sketches for Lope de Vega's Fuente Ovejuna, and fragments for projects on Giraudoux's Ondine and Shakespeare's Macbeth exist in the Munich City Library. As exemplified in the scene based on Sodom and Gomorrah, Hartmann became increasingly concerned with nuclear holocaust, technological abuses and environmental pollution. Mention should also be made of Hartmann's contribution to the Jüdische Chronik, a series of musical compositions that were commissioned in the early 1960s to commemorate the Jewish victims of the Holocaust. Complementing works contributed by Blacher, Henze, Dessau, and Wagner-Régeny, Hartmann's movement (Ghetto) served as a threnody to the last moments of the Warsaw Ghetto.